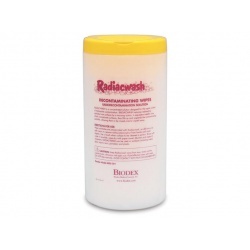 Radiacwash™ Decontaminating Wipes are the most efficient and safest way to remove radiocontamination from hands and small objects. Simply dispense the Radiacwash pre-moistened wipes from the canister, scrub hands thoroughly and wash the contamination away with running water. Each wipe measures 7" x 8".